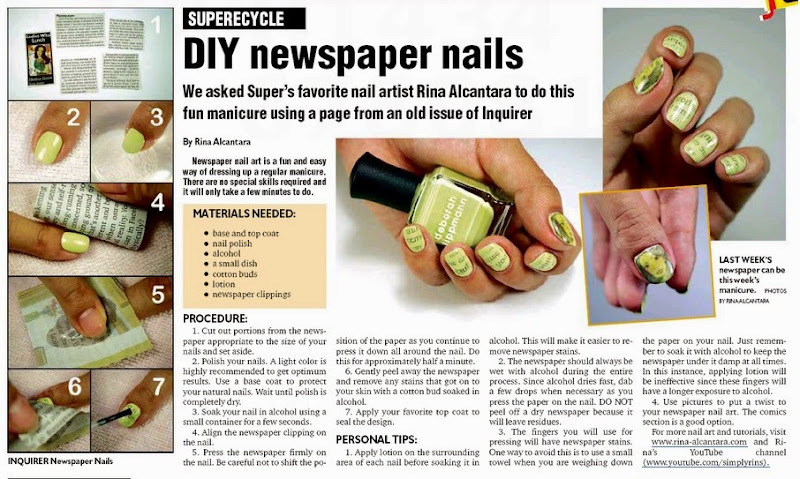 So I finally got to do newspaper nail art and it was featured on the Philippine Daily Inquirer newspaper last August 16, 2014. Newspaper nail art for a newspaper! How cool is that?! 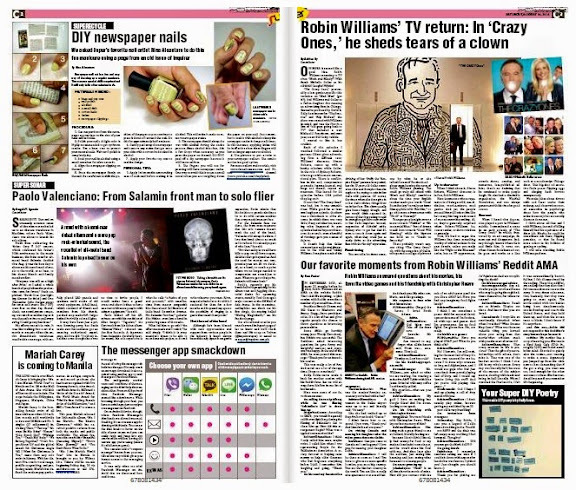 The opportunity required that I use pages from the local publication to do a photo tutorial on how to create a do-it-yourself newspaper nails. The tutorial appeared on the Lifestyle section, under "Superecycle". Aside from the step-by-step procedure, I also included personal tips on how to do this fun nail art design. It was my first time to attempt to do newspaper nails and I have to admit that I had a rather hard time even if there were a lot of tutorials already published online by various nail artists. I was particularly concerned with transferring as much of the ink into the nails because I wanted the letters to be more visible. I was using white polish as base when I was trying out to do this nail art. But when I finally got the hang of it (after so many trial and errors), I decided to use a pastel color to make it a little different. I used 2 coats of Deborah Lippmann Spring Buds, a very light green shade. I also decided to use a photo for added twist. Luckily, the column by Thelma Sioson San Juan entitled "Ladies Who Lunch" had a beautiful woman as avatar. I used that and her article for the nail art tutorial. Applying lotion on the skin surrounding the nail will make clean up of newspaper stains easier. Make sure the newspaper is always wet with alcohol and keep adding more alcohol as you press the paper on your nail. Press firmly is the key to make the text/image more opaque. If you are adding more alcohol, make sure the newspaper does NOT detaches or shifts from the nail. Based on my trials, once the paper is lifted from the nail in any way, repressing will NOT make the text/image more visible.